PORTSMOUTH, ENGLAND--(Marketwired - Jan 17, 2014) - Aspiring to be a leader in demonstrating how responsible hotel management can make a positive impact on the environment while also creating economic opportunities within their community, a green hotel in Portsmouth, UK is making advancements in the way it does business, recognizing that even little changes can result in a more efficient and sustainable environment. Winning several national and regional awards along its path to recycling 100 % of its waste from bedroom to kitchen, the Portsmouth Marriott Hotel takes its enthusiasm for a greener world all the way to the boardroom, offering green meeting rooms that set the standard among Portsmouth, UK hotels. Featuring state-of-the-art amenities, the property's 8,450 square feet of space includes everything from the distinctive Victory Boardroom to the spacious Mary Rose Suite, with plenty of breakout rooms and on-site exhibition space as well. New for 2014, the business hotel's Green Meeting Package is perfect for hosting environmentally-friendly gatherings in Portsmouth, UK that are sure to impress clients and associates with the efficient use of energy and resources that are supportive of a greener future for everyone. Interactive white boards replace wasteful flipcharts and new meeting room technology give hosts total control of digital resources so they can create dynamic, collaborative work sessions and engaging presentations. Voted "Most Green Hotel" for the UK South by Marriott International. Engaging those who support the hotel in its sustainable efforts, the hotel also has an ongoing tree planting program in which a tree is planted in the name of every company hosting a meeting totalling more than £3,000. In addition to the satisfaction of knowing a tree has been returned to nature in their name, participating organizations also receive a certificate that is ideal for helping clients recognize their ongoing green commitment. 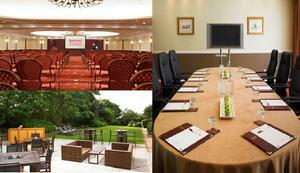 For more details or to book an event, call 023 9238 3151 and quote "BUSMAG01" or email Katie.Dawson@marriott.com. The Portsmouth Marriott Hotel welcomes travellers with fresh and exciting guest rooms, warm and contemporary public spaces and elegant, high-tech event venues conveniently located near some of the area's finest attractions. Combined with a relaxing outdoor area and exceptional on-site dining at the Sealevel Restaurant & Lounge the hotel's facilities and luxury amenities create a remarkable hotel experience whether travelling for business or leisure. Guests also enjoy access to an impressive indoor pool and state-of-the-art fitness centre which offers complimentary fitness classes as well as special guest privileges to the hotel spa where a full menu of services are designed to rejuvenate the mind, body and soul. New for 2014, Portsmouth Marriott Hotel’s Green Meeting Package is perfect for hosting environmentally-friendly gatherings in Portsmouth, UK that are sure to impress clients and associates with the efficient use of energy and resources that are supportive of a greener future for everyone.